Our nursery children look forward to the Saturday morning treats, Mr. Steve brings in for them. 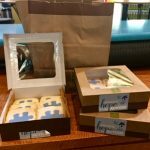 research to children of autism by purchasing the puzzle piece cookies for our gym children. It is a win/win for all!